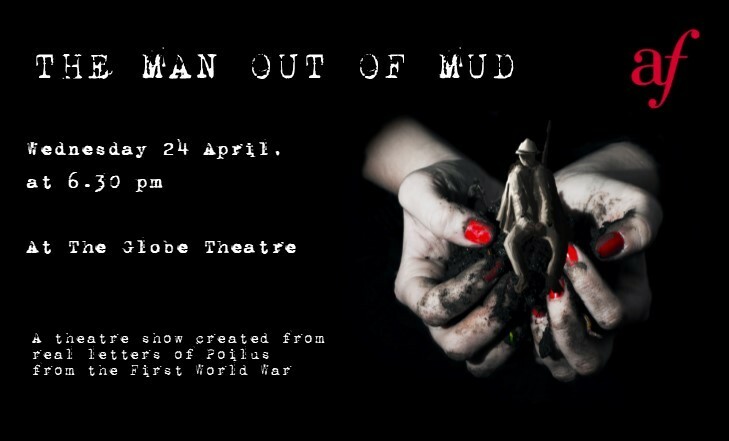 The Man Out of Mud (L'Homme de Boue) is a dynamic, modern and passionate one-man show. It is the story of a young man who went to war, with his innocence and who will discover the horrors for which no one had prepared him. To escape, he will have no other choice but to concentrate on the pleasures of life that will save him from going mad. A violent transition to adulthood but with irony and humour! Created from real letters of "Poilus" from the First World War, this theatre show has been on tour since 2014. Don't miss this one-off performance in Palmerston North, on Wednesday 24 April at 6.30pm at The Globe Theatre (312 Main Street). Licensed café/bar service will be available from 6pm. No charge for low income or community services card holders. Suggested koha $20-40 for those who can afford it.